For bathrooms where space is limited the Match 1000mm Furniture Run is the ideal solution. 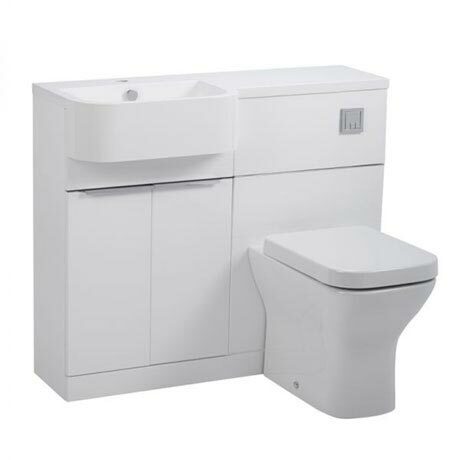 Sleekly designed in a gloss white finish, the furniture run consists of a 500mm double door vanity unit which is paired with a 500mm back to wall unit. The vanity unit is finished with discreet chrome handles and a decorative chrome trim on the back to wall unit. The 1000mm Isocast basin features a single tap hole with overflow and an integrated worktop. Manufactured using a calcium carbonate mineral substrate. A resilient gelcoat is then applied which is durable and easy to clean and gives the basin a glossy finish. Available in a left or right hand option. Please note: pan, cistern and tap not included.